You like cheese. You like salsa. And, you like tacos. This is your dish. 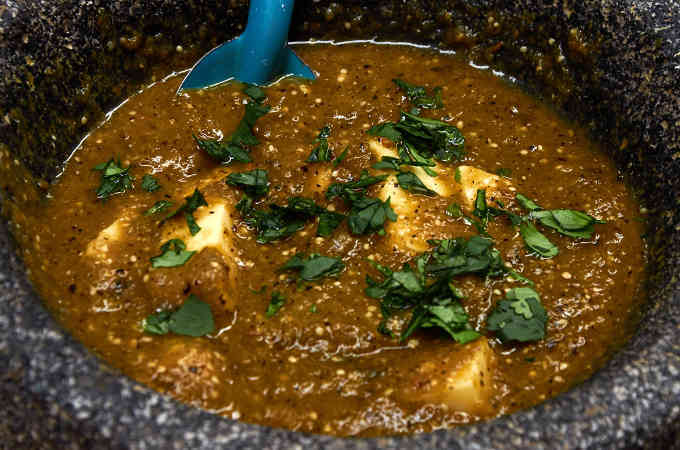 Chunks of asadero cheese softened in a spicy roasted green salsa served on warm corn tortillas. Asadero cheese is a melting cheese commonly used to make quesadillas. It’s very popular in the states of Durango, Aguascalientes, Jalisco and Guanajuato. 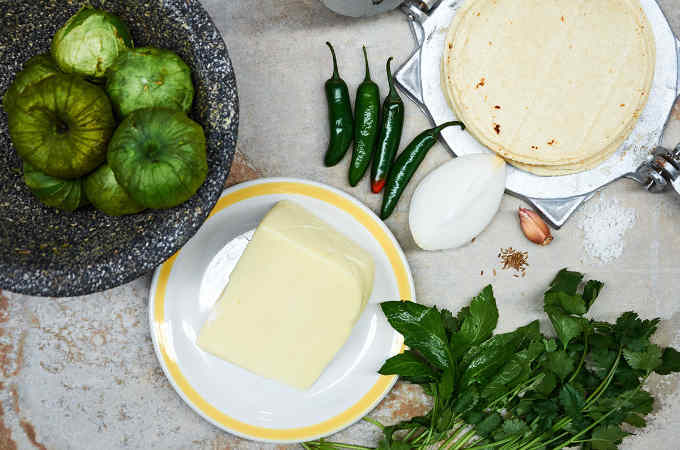 Make a double or triple batch of these tacos for your next taco party, called a taquiza. 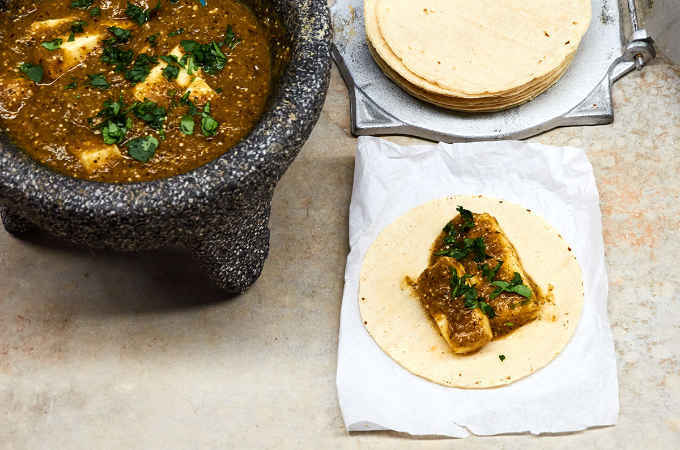 On your serving table, place a large bowl with the cheese and salsa and a stack of warm corn tortillas on the side and your guests can easily make their own tacos. Blacken the green tomatoes, onion, serrano chiles, and garlic in a dry medium-hot pan. Leave the skin on the garlic. You will remove it after charring. Cook until the vegetables have blackened. 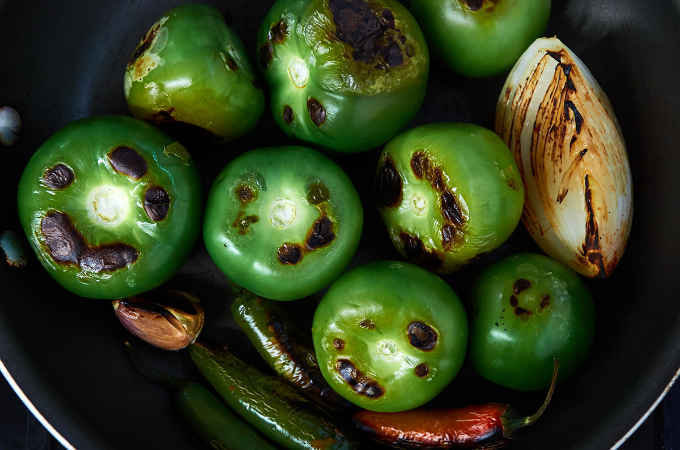 This step adds a deep rich smoky flavor to the salsa. 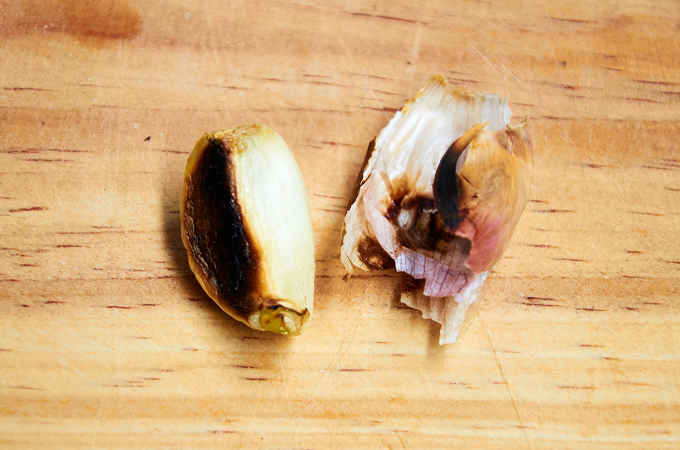 Let the garlic cool to the touch and then remove the papery skin. Chop the garlic very finely. Leaving the skin on keeps the garlic from becoming bitter. Cut the tops off of the chiles. If you prefer a milder salsa, you can also remove the seeds and stems. We chose not to remove the seeds because we like a salsa with some heat. A fair warning, this salsa is quite hot. Put the charred vegetables in your blender with 1/2 cup water. Blend for 1 minute until evenly blended but still has some texture. Don’t over blend. 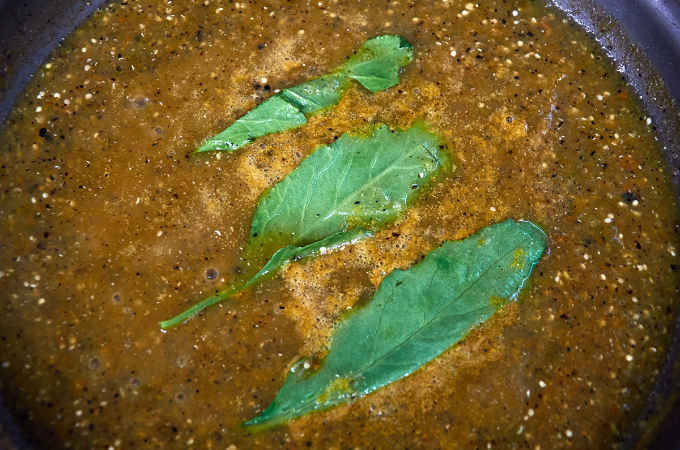 In the same pan you used to blacken the green tomatoes, preheat 2 tablespoons of cooking oil over high heat then pour the blended salsa into the hot oil. This step is called “seasoning” and it is important to fully develop the flavor of the salsa. Bring the salsa to a boil and reduce the heat to medium. Cook for 10 minutes. After ten minutes, add the finely chopped garlic, whole cumin seeds, and salt. Add the fresh epazote leaves. 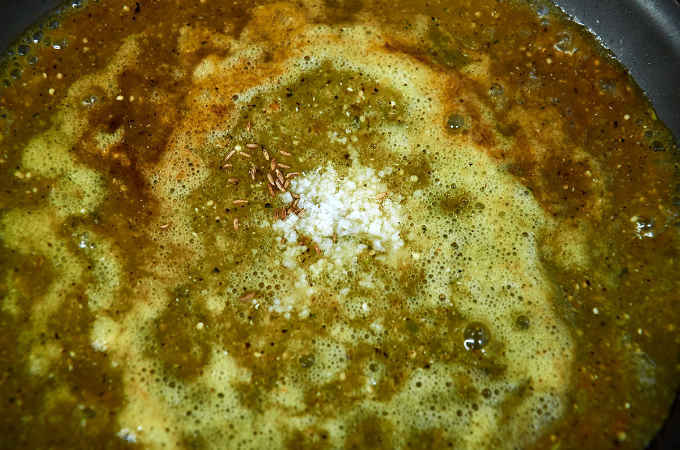 You can substitute 1 teaspoon dried epazote. Chop the cheese into bite-sized chunks. Pour the hot salsa into a serving bowl and then add the cheese. 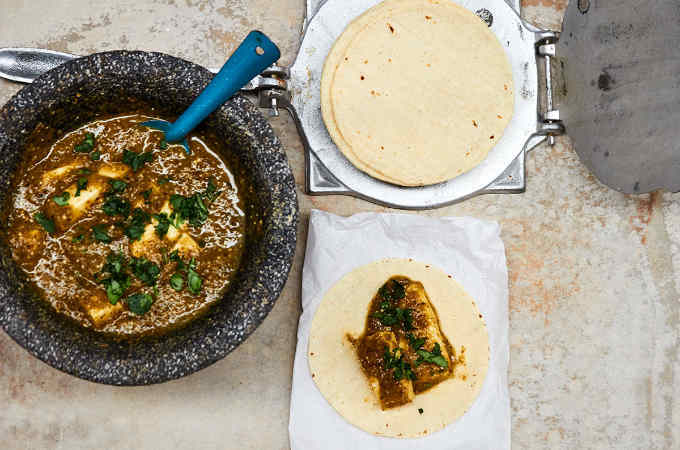 A stone molcajete makes a great serving dish. Stir to cover the cheese with salsa and sprinkle with the chopped cilantro. Let rest for 10 minutes to soften the cheese. Be sure to warm the tortillas. Place them on hot comal or griddle for about 30 seconds per side. For each taco, spoon 2 or 3 chunks of cheese and salsa on each tortilla. Serve immediately. We like these tacos with an icy cold Mexican beer. 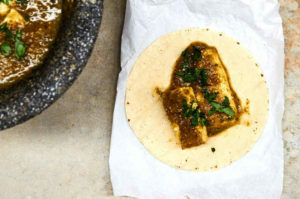 An easy to prepare taco filling made with chunks of asadero cheese softened in a spicy roasted green tomato salsa served on warm corn tortillas. 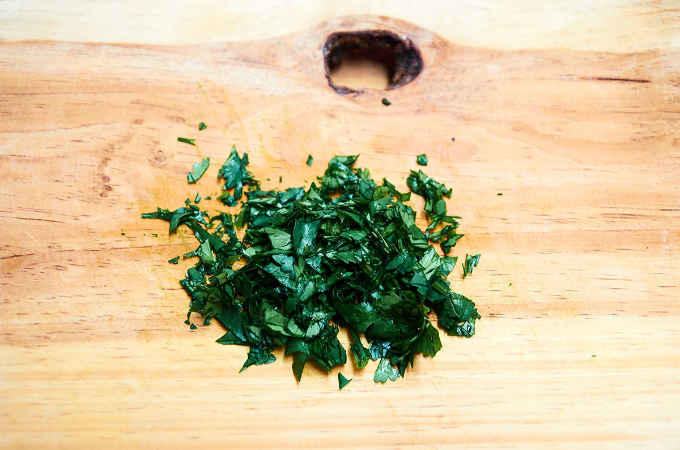 Garlic, cumin, and epazote add a deep herbal flavor to the salsa. In a dry medium-hot pan blacken the green tomatoes, onion, serrano chiles, and garlic. Leave the skin on the garlic. You will remove it after charring. Cook until the vegetables have blackened. Let the garlic cool to the touch and then remove the papery skin. Chop the garlic very finely. Cut the tops off of the chiles. If you prefer a milder salsa, you can also remove the seeds and stems. 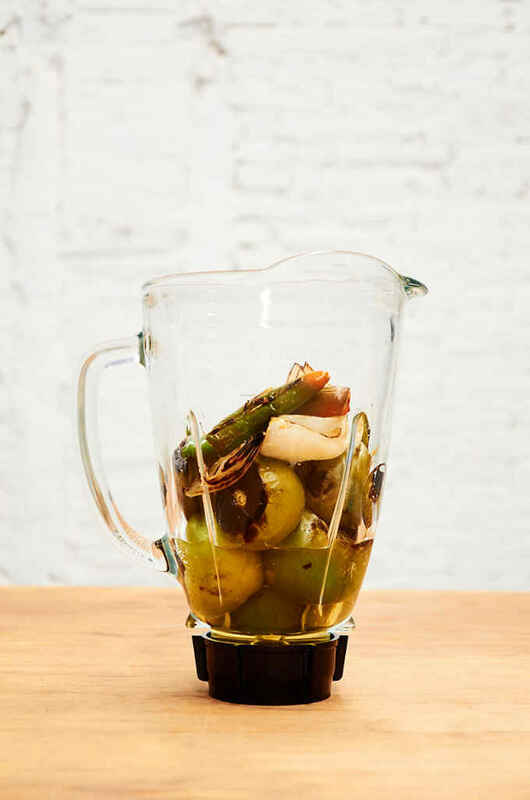 Put the charred vegetables in your blender with 1/2 cup water. Blend for 1 minute. Preheat 2 tablespoons of cooking oil over high heat. 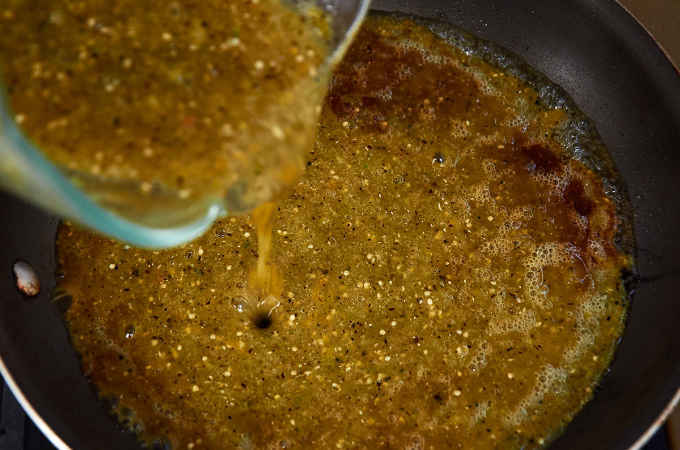 Pour the blended salsa into the hot oil. In the same pan you used to blacken the green tomatoes, preheat 2 tablespoons of cooking oil over high heat then pour the blended salsa into the hot oil. After cooking for ten minutes, add the finely chopped garlic, whole cumin seeds, and salt. Stir and then add the epazote leaves. Chop the cheese into bite-sized chunks. Pour the hot salsa into a serving bowl and then add the cheese. While the cheese and salsa are resting, heat the corn tortillas 30 seconds per side on your comal or griddle. For each taco, spoon 2 or 3 chunks of cheese and salsa on each tortilla. Serve immediately. A word of warning. This salsa is very spicy. If you prefer a milder salsa, you can reduce the number of chiles from 4 to 2. 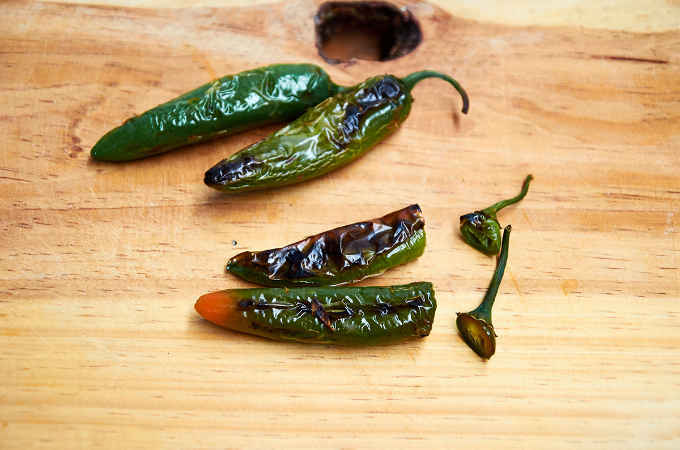 To reduce the heat even more but still retain flavor, remove the seeds and veins from the chiles. 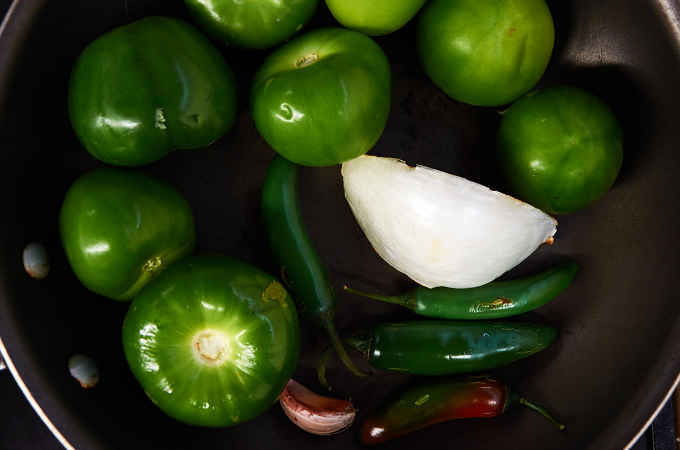 You can use jalapeño peppers instead of the serrano pepper for a milder salsa. The flavor won’t be as bright but it will still be delicious. 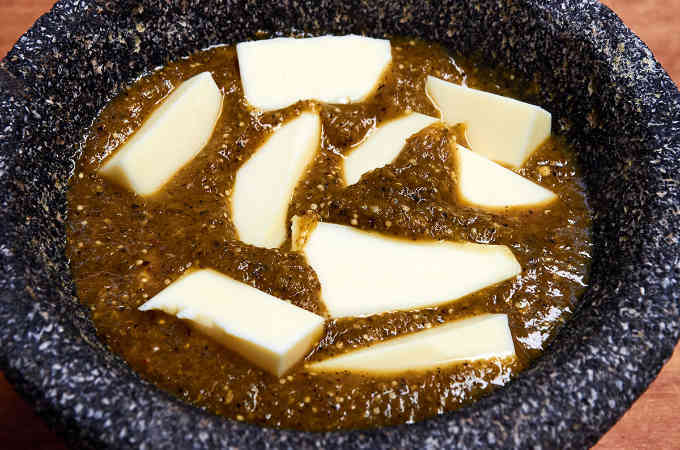 Any of the following cheeses will give you good results: queso asadero, queso Chihuahua, queso Oaxaca, or queso panela. In a pinch, you can even substitute mozzarella or provolone. These tacos are served warm not piping hot. This dish keeps well in the refrigerator for up to 2 days. To serve, reheat in the microwave until the salsa is hot and the cheese has softened. (About 1 to 2 minutes depending on your microwave.) Don’t allow the cheese to melt. These are definitely going to become lunch as soon as I get a chance to make them. I will be using fewer chiles, minus the seeds and veins, so we can enjoy them without repercussions. You describe ‘green tomatoes but picture Tomatillos nowhere the same…so which is it? Thanks.